Home to the Okavango Delta, Moremi Game Reserve, Chobe National Park and Savute – famous for its elephants – Botswana is one of the premier game and safari destinations in the world. Aside from the game viewing opportunities, Botswana is home to Victoria Falls. This makes a Botswana safari an ideal opportunity to visit this natural wonder. The sample itineraries below give you just a taste of what you can expect. 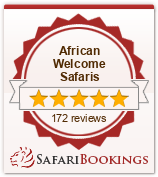 Contact one of African Welcome Safaris travel experts to start planning your ideal Botswana trip.